At the January meeting of Metropolitan’s Special Committee on the Bay-Delta, Program Manager for Bay Delta Initiatives Steve Arakawa updated Committee members on the recently-released Design and Construction Enterprise draft agreement and the permitting issues for the California Water Fix project. Mr. Arakawa then proceeded with an update where the California Water Fix is in the planning process, focusing on the Design and Construction Enterprise and the permitting process with a particular emphasis on the State Water Board. Back in the middle of January, the Department of Water Resources released a draft agreement for the Design and Construction Enterprise which is the means by which the tunnel pipeline project would be managed. Mr. Arakawa noted that DWR began taking internal steps for this process back in May of 2014, and since that time, the project planning has continued. 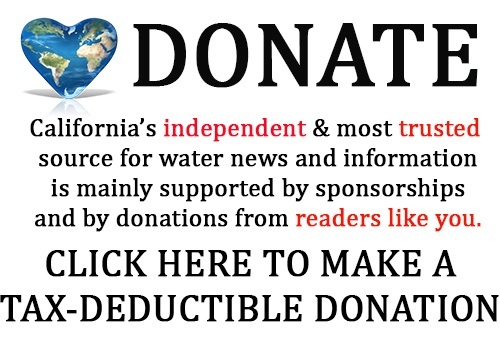 The intent of the Design and Construction Enterprise is to organize the resources and the staffing efforts around the California Water Fix project as a single mission effort of the organization whose sole purpose would be to design and construct the California Water Fix; the organization would go away after the completion of that, he explained. The Design and Construction Enterprise would provide the means of designing and constructing the project. 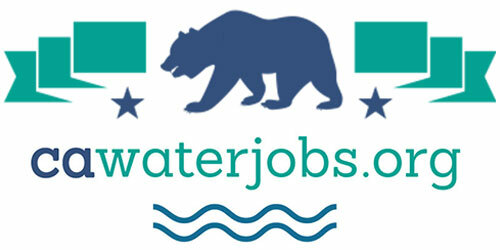 It would be a separate enterprise operating under DWR authorities and would be located in a different place than the other existing staffing resources of the DWR. After completion of the project with the project operational, the Design and Construction Enterprise would then be dissolved because its mission would be completed. The enterprise would be led by a program director who would be responsible for the day to day management of all of the activities related to completing the project, including reporting, management of consultants, providing information on progress, etc. 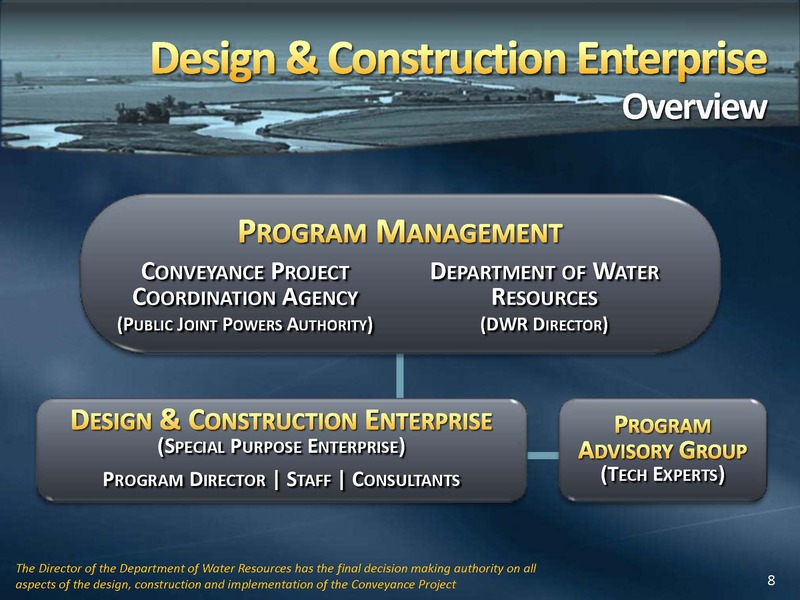 The Design and Construction Enterprise itself would be managed by a program director; it would have a combination of staff resources that could come from DWR, other contracting water agencies, and consultants. “The program director would be responsible for managing all of this, and the program director would be reporting to both the DWR director and to the conveyance project coordination agency or public agency JPA,” he said. He noted that an advisory committee will be assembled to bring in experts to help provide technical expertise to help support the project. The Enterprise will manage the design and construction of the project. The agreement would be executed after the Record of Decision and Notice of Determination at the completion of the environmental review process. Mr. Arakawa said the water contracting agencies through the JPA would have the ability to weigh in on matters that materially affect the project, such as anything affecting the budget, schedule, or permitting issues. 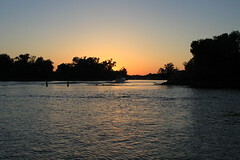 The State Water Board will begin hearings in April on the place of diversion for the project on the Sacramento River, so those proceedings are beginning to be organized; notices to appear have been filed by the different entities, including the water contractors, and briefs are being developed, Mr. Arakawa said. 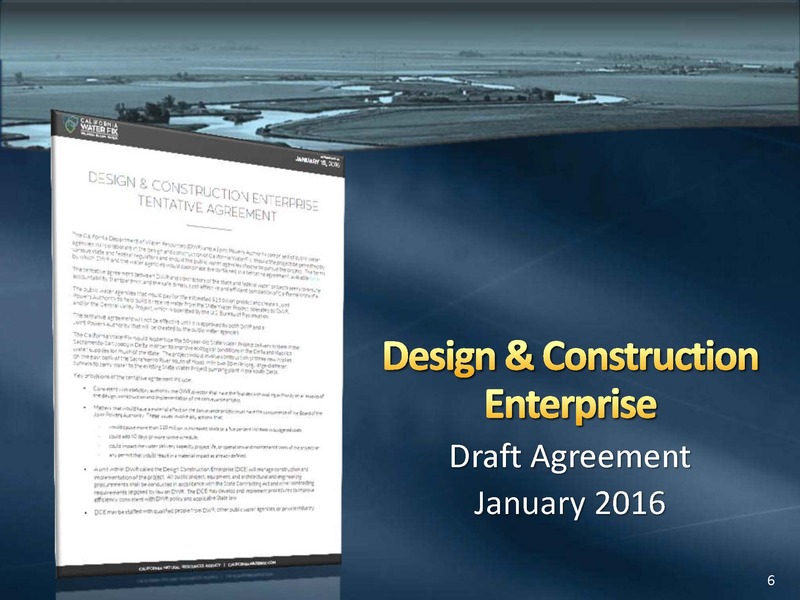 He then presented a timeline showing the different permitting aspects of the project, noting that the diagram covers the period from 2015 to early 2017. The first section of the diagram is related to compliance with the Endangered Species Act. The second section is the environmental process under CEQA and NEPA and the preparation of the EIS-EIR and the completion of decision making process. 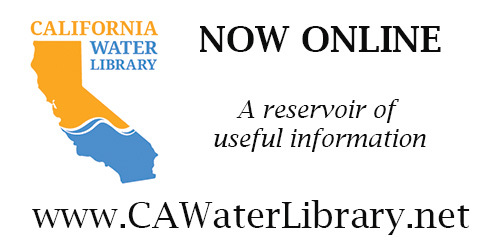 The third section is the water rights and water quality permitting processes at the State Water Board. The fourth section are the various Army Corps of Engineer permits that are required. Mr. Arakawa then discussed each one of these permitting processes in turn. With respect to the Endangered Species Act, the key activity has been the development of the biological assessment that’s been going on for several months now. The biological assessment provide the description of the project and how it would be operated. It is the basis for consultations between the Bureau of Reclamation and the Department of Water Resources and the regulating agencies, in this case the US FWS which has jurisdiction over Delta smelt and the NMFS which has jurisdiction over salmon and steelhead. “The preparation of this biological assessment is a key milestone in the process for seeking the permits under the Endangered Species Act on the federal side,” he said. 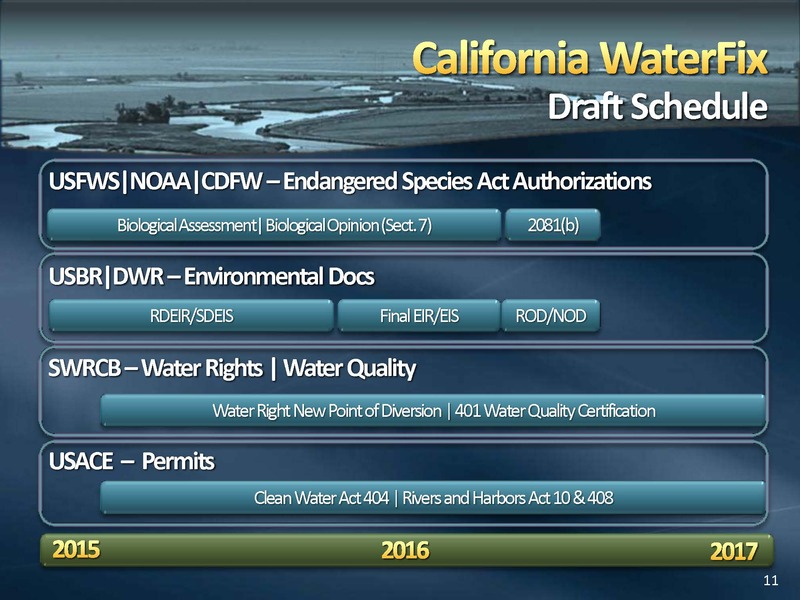 Similarly, the documents are being prepared on an application for compliance with state endangered species regulations under Section 2081b of the State Endangered Species Act; a lot of the same information is drawn in terms of how the project is going to be operated, how its described, etc, for the fish agencies to make a determination, he said. Phase 2 focuses on the fish and wildlife and environmental aspects of the project. With this proceeding, the board will look specifically at the tunnel project and how that tunnel project affects fish and wildlife and what kind of flows are necessary in order to support the proposed project. Hearings on phase 2 would begin after the Notice of Determination and Record of Decision, after the Record of Decision or the environmental planning process is completed. Mr. Arakawa noted that the State Water Board has a separate and parallel process looking at the existing water quality control plan for the Bay Delta that is proceeding on a parallel track. Lastly, the Board has its water quality certification review. “The Executive Director has the authority to make a decision on the water quality certification to indicate that the project is protective of existing water quality regulations, and as I mentioned earlier, that decision could come at any time prior to the end of that timeline,” he said. Mr. Arakawa said that on the State Water Project side, discussions are continuing amongst the State Water Contractors regarding how the California Water Fix would be implemented and how it would be paid for. “Those kind of conversations are continuing, along with how water can be managed on a year to year basis between the contractors to provide the kind of water management capability that contractors are looking for to help support moving forward with this decision on the project,” he said. Watch the webcast and view meeting materials for the January 26, 2016 meeting of the Special Committee on the Bay-Delta by clicking here.